Posted on December 21, 2015 in Community by Emily E. Steck. Freelancing is a beautiful thing. You’re doing what you love, on your schedule and in your pajamas (or is that just me? I doubt that’s just me). Of course, there are complications such as finding work, keeping work, getting paid and paying taxes, but it’s part of the job. Being a freelancer is a rewarding if not exhausting experience and you need to treat your writing career like a small business. That means wearing many hats: as a freelancer, you’re the CEO, CFO, account manager, marketing department, office manager, accountant and writer, all-in-one. Now, you’re bound to dislike some of the tasks you need to do. For me, that task is creating and distributing invoices. I’ve been told to think of an invoice as a bill you receive at a restaurant. When you go out to eat, your waiter hands you a bill at the end of the meal to pay up. It’s detailed with the company’s information, the items you ordered, taxes and even a place for a tip. You review the information, pay using one of the restaurant’s preferred methods and leave. You get a happy meal, and the restaurant gets money. If only invoicing were this easy. Seriously, invoicing and accounting is my personal nightmare—one I’m sure I share with plenty of other freelancers. Juggling different clients, navigating an accounting system and keeping records for taxes is a daily struggle. But based on my own trial and error (plus some research), I’ve created a fun little guide to invoicing for freelancers. Services rendered: “Completion of service requested by a client resulting in payment request” or a detailed list of what you’re charging for including tax, discounts, etc. The amount of money owed: Cha-chin! Make note of the type of currency like USD, CAD, etc. 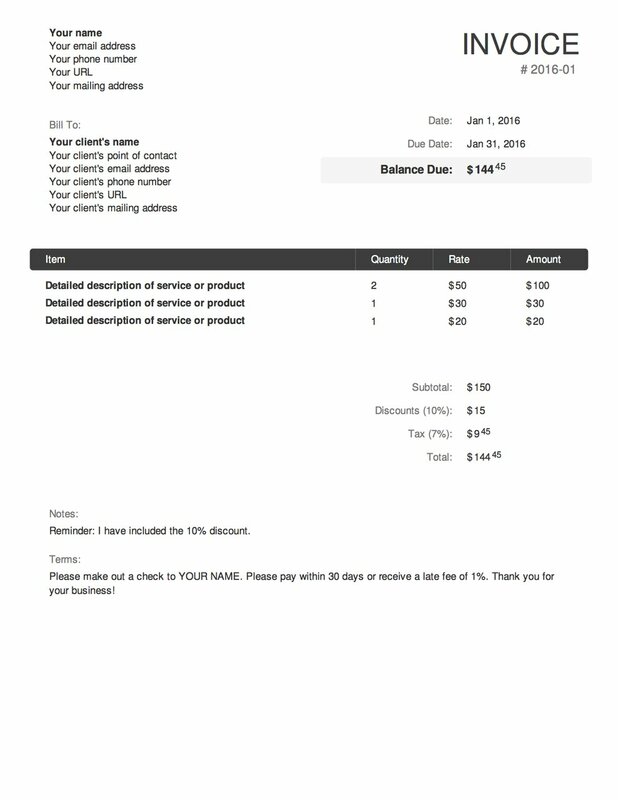 Here’s an example of one I quickly created with an invoice generator. It may seem easy enough, but creating invoices can take time. Some business owners claim that invoicing (creating, sending and chasing invoices) can take up to 10% of their work time according to this Xero survey. 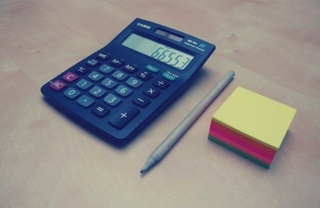 Factor that time into your work schedule by invoicing as you go through a project. This dear old tip comes from my dear old dad, who’s owned a small business for over 20 years now. In Dad’s words, “As soon as you’re finished the job, your next step is to hit send on that invoice.” Cash flow issues have long plagued freelancers. Promptly sending an invoice is never a guarantee that you’ll be paid on time, but sending it late will do you no favors. Pro invoicing tip from @QuietlyContent: As soon as you’re finished the job, send the invoice. The number one mistake newbie (and even experienced) freelance writers make is not treating your freelance writing career like a small business. Even if your freelance writing gig is on the side, you still want to make sure you keep your invoices, taxes and other important documents consistently organized. That’s why I recommend using software over a template or invoice generator. Not only does it keep all of your invoices in one place, but they make life easier. Many of them allow you to create recurring/frequent invoices that send automatically as well as implement other customizable features. The most important decision you can make is selecting a good invoicing software that meets all of your needs. What's nice about this accounting and invoicing software is that it caters to creatives and freelancers. It's free for the first 30 days. Thereafter, FreshBooks is $19.95 per moth for one user and up to 25 clients for unlimited invoices or $29.95 per month for unlimited clients and up to five users. It has a clean look and feel, easy to use and can help keep track of all of your invoice expenses. Unlike your average invoicing software, Harvest also makes it easy to log and track hours spent on the job. But what makes Harvest a real steal of a deal is its price after the 30 day trial—under its Solo plan, you pay $12 per month to manage unlimited projects, clients and invoices. If you want something professional and affordable, Harvest is probably the software to choose. If you're looking for a comprehensive accounting and invoicing software that's free, you can't get any better than Wave. Though it's geared more toward small businesses who need payroll and other accounting functions, it's easy to create and send invoices right from the platform. Plus, it can accept payments on your behalf for 2.9% + 30¢ per transaction. The downside? It's not super easy to navigate at first for freelancer needs and loads very slowly. But if you just need a simple software to create consistent invoices, Wave works great. What's nice about LessAccounting is that it's a great software and service for newbies and experienced bookkeepers alike. For $20 a month, freelancers can manage their own books and expenses with their comprehensive software. For those freelancers flush in a little more cash, you can "splurge" for $125 a month for one of LessAccounting's personalized bookkeepers who keep on top of and track of your accounting needs. Another good freebie for your basic needs, Hiveage Free lets you create and send as many invoices as you'd like (but no recurring invoices). That said, if you want to upgrade to any of their module features (like recurring invoices, tracking time and expenses, etc.). It's one of the best softwares to use-sa-you-go to see what works for your business needs. Remember the days when you were so happy to get work that you didn’t even bother signing a contract? Not having a contract in place is a surefire way to get screwed over re: not getting paid, doubling your workload and hurting your relationship with the client. If you’re working for an agency or service, a contract with terms, conditions and legal jargon will probably be provided for you once you begin writing for them. If your client doesn’t propose a contract, it’s essential that you do. You don’t have to be a lawyer to write down a contract that includes things like copyrights, deadlines, pricing and invoicing. Whatever you and your client decide on, it should be spelled out and signed by both parties to avoid confusion. If you need help creating a contract of your own, check out some of Freelancers Union’s free resources. When it comes to invoicing your client for your services, you need to review your contract to make sure everything matches up. If your contract says you get paid by check and your invoice says PayPal, it may take longer for you to get paid. Likewise, you need to realize if your client is asking for more work out of the project scope or more than what you agreed upon. If that’s the case, politely notify them of extra services charges since you’ll be doing more work. You should already be in the habit of backing up your work; do the same with your records. Don’t rely on your invoicing software to keep track of everything. Whether you photocopy, print, download, store in the Cloud or store on your computer’s local storage, you’ll want to keep extra records and copies of anything about an invoice. In case technology fails, you’ll have a backup ready to send. Since some of the “clients” or gigs have been one-offs (or ask me to use their invoice templates), I use an external spreadsheet to keep track of when I send out an invoice, when I get paid and if there are any complications. I developed my system of labeling invoices by Year-Number and using color-coded labels to know the status of payment. Research and develop your own record keeping system that suits your needs. Haven’t heard from a client in a while despite sending that invoice a month ago? It’s time to follow up. It was time to follow up a day or two after you sent it to see that they received it. Some people recommend picking up the phone and calling clients to make sure, but play it by ear. Always be polite and friendly with your clients during follow-ups, especially if it’s been over a month since you sent them an email. This is another reason to use invoicing and accounting software: plenty of software allow you to send friendly reminders that an invoice is due soon or that an invoice is overdue. And… that’s about it, folks! Remember to cross the T’s and dot the I’s, review your invoices carefully and pray there are no complications.